I seem to come back from Barnsley Archives every week with the inspiration for a new story. This week it was a bit of a side step from my usual War Memorials but still concerned with First World War Soldiers. In Jon Cooksey's book, Barnsley Pals, he comments that by Easter of 1915 the second Battalion of volunteers raised by the town were outgrowing their accommodation in the Public Hall in Barnsley. Yesterday in the Archives I was thrilled to find documentary evidence of this event while searching through the Regent Street Congregational Church documents filed as item A/163/2/N in the catalogue. This is four boxes of items, from marriage registers and annual accounts to Sunday School programmes and minute books. 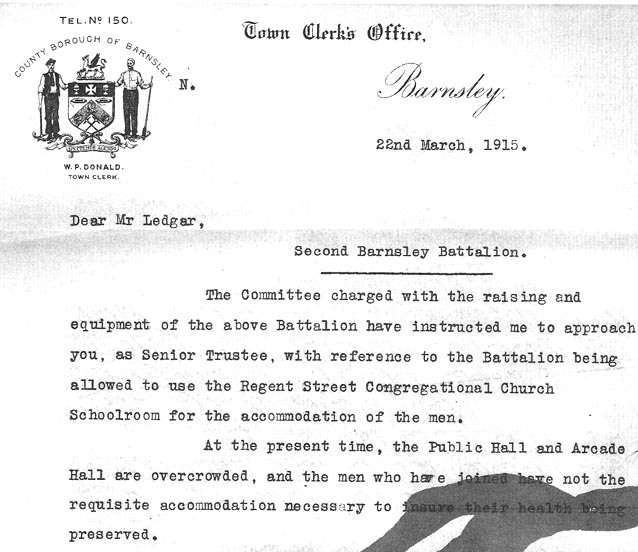 "The Committee charged with the raising and equipment of the above Battalion have instructed me to approach you, as Senior Trustee, with reference to the Battalion being allowed to use the Regent Street Congregational Church Schoolroom for the accommodation of the men. At the present time, the Public Hall and Arcade Hall are overcrowded, and the men who have joined have not the requisite accommodation necessary to insure their health being preserved." This sounds more as if the Town Clerk is putting forward the idea to the church than the church offering, however I suppose it could just be putting in writing something that had already been informally discussed. 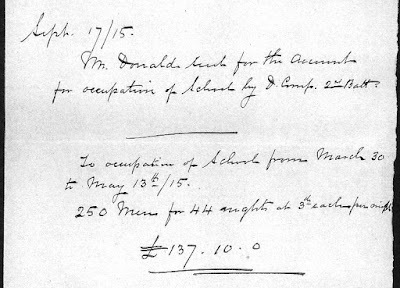 Later in the letter Mr Donald assures the Trustees of the 'absolute urgency' of the situation and explains that an allowance of 1d to 3d per man per night 'with a depreciation allowance in certain cases' would be paid to them by the War Office. 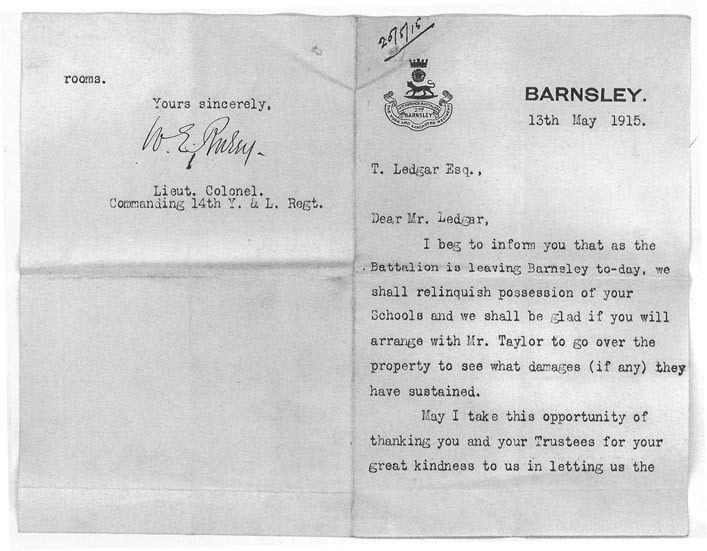 The Trustees obviously accepted the arrangements and the next letter in the file is dated 13th May 1915 and is from Lieutenant Colonel Raley, commanding officer of the 14th York and Lancaster Regiment and well known Barnsley solicitor. He is writing to thank the Trustees for their 'great kindness in letting us the rooms' and offers to make arrangements to see 'what damages (if any)' have been caused during the soldiers' occupation of the Schoolrooms. 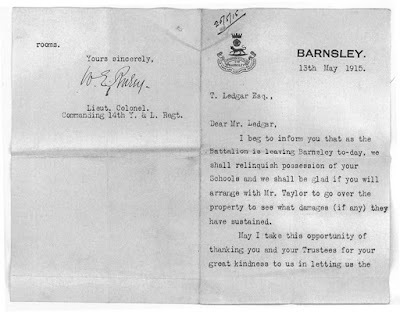 This letter was actually the first item I spotted in the file as the Barnsley Battalion Coat of Arms, enlarged here on the left, was in bright red and raised up on the writing paper. As you can see the letter above was folded and would have been read right hand side first and then turned over to read what we see on the left. The easiest way to type a small sized letter maybe? There was nothing on the other side. It was quite thrilling for me to hold something that had been handled and signed over 100 years ago, last month in fact, by W E Raley whom I have read so much about. 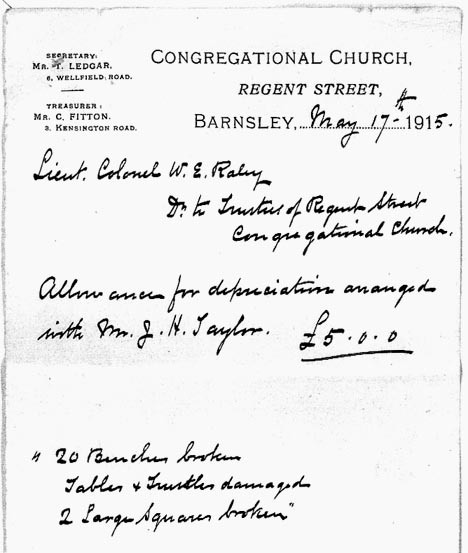 The survey mentioned in the letter must have taken place, as the next relevant item was an account from the Church to Lieutenant Colonel Raley concerning the depreciation. Obvious from this letter and the accompanying account from a contractor for £20 17s 6d for cleaning and whitewashing the schoolrooms and toilets is the fact that putting up 250 men in an enclosed space for 44 days is going to end up in some damage and 'soiling' of the accommodation. Lieut Colonel Raley obviously had more confidence in his men than was necessarily justified. A price of £5 has been agreed to cover the damages which include 20 broken benches, damaged tables and trestles, and 'two large squares broken' (any ideas?). What were the men doing to cause so much damage? High spirits and fooling around probably, as might be expected when 250 young men are cooped up together! Unfortunately I also found a reply from Lieut Colonel Raley to the effect that the Trustees had misunderstood his previous letter and that depreciation was included in the payment of 3d per man per night. Which I found a bit petty ... in today's money, according to The National Archives Currency Converter, £5 is around £215. Not much to replace or mend those damaged items really. 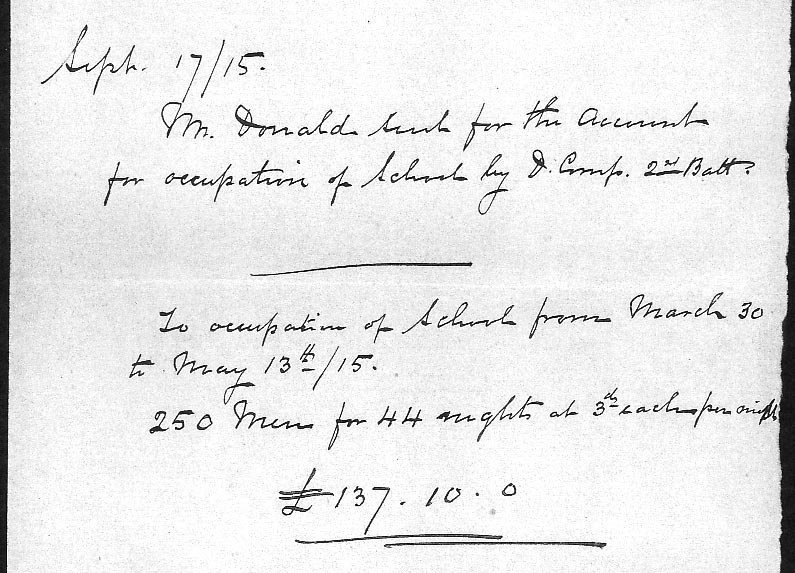 Finally, in September 1915, there is a note that the payment had been received for the occupation of the School by D Company of the 2nd Battalion of the Barnsley Pals. It records that the 250 men were on the premises from 30 March to 13 May 1915, that is 44 nights at 3d per man per night, amounting to a reasonable £137 10s. 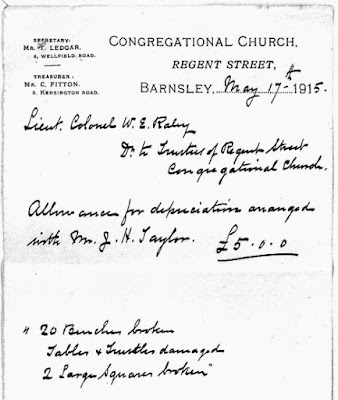 Again using the TNA's currency converter I see that that is equivalent to nearly £6,000 in today's money so I suppose the declined £5 for the damages was quite a small amount considering the overall sum the Church received. 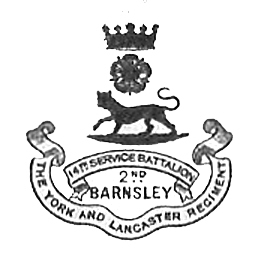 On Friday 14th May 1915 both Battalions of the Barnsley Pals boarded trains at Barnsley station to be taken onwards to Rugeley in Staffordshire for further training. Jon Cooksey (1996, p.83) notes that, "Barnsley was to see them together just once more before they left England for overseas service." Children were allowed the day off school and families lined the streets to say goodbye to their sons and brothers, husbands and fathers. 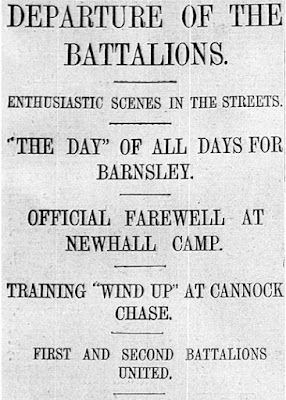 The entirety of the front page of the Barnsley Chronicle the following day was taken up with reports of the day, overflowing onto page 3 of the paper. 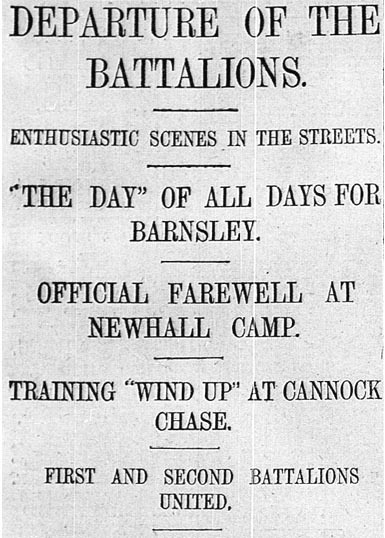 If you want to read more about the moving scenes in Barnsley that day you can browse the Barnsley Chronicle at Barnsley Archives absolutely free of charge. It is available digitally and on microfilm and copies of articles can be bought for a reasonable 55p an A4 page. I find reading the old newspapers completely addictive and just as likely to produce wonderful stories as searching through boxes of old documents. 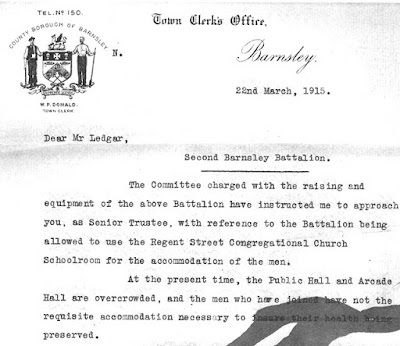 I hope you have enjoyed this glimpse into the history of the Barnsley Pals as much as I did when I discovered it in the Archives yesterday.